Hello all wonderful design people we are doing additions home, and would be grateful for any help. 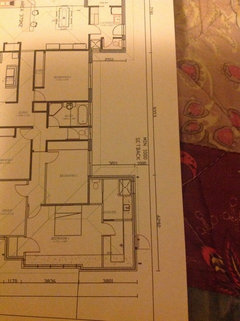 We have just discovered that our Architect made an error when designing this area and we have gained an extra meter in width of WIR and ensuite. 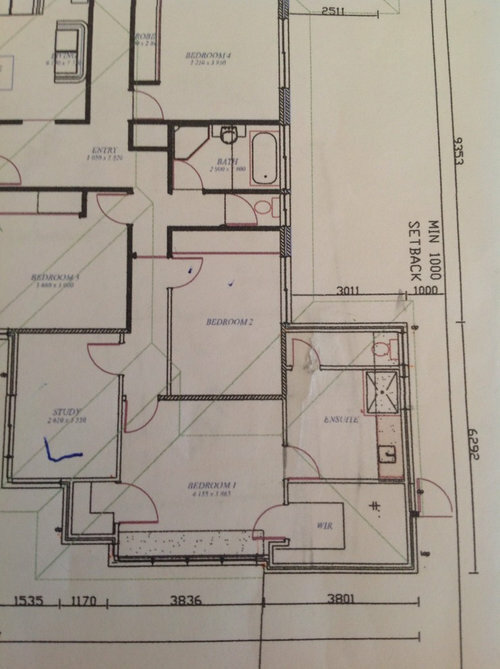 Due to set backs the printed plan the outside walls are not able to be moved, nor is the walls for 2nd bedroom as it is existing the windows have already been delivered so don't want to change them. Our master bed room is not very large so we would prefer the extra space to be in the bedroom if possible as we have a king sized bed. 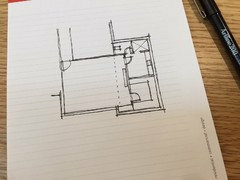 The printed plan has the extra space in the bathroom and WIR the hand drawn is my attempt to add the space to the bedroom, with the dotted line being the new bedroom wall. We are not interested in a bath but the separate toilet is desired. The vanity is 1500 and thought that it would be floating with 2 drawers and a 600 small cupboard for extra storage. 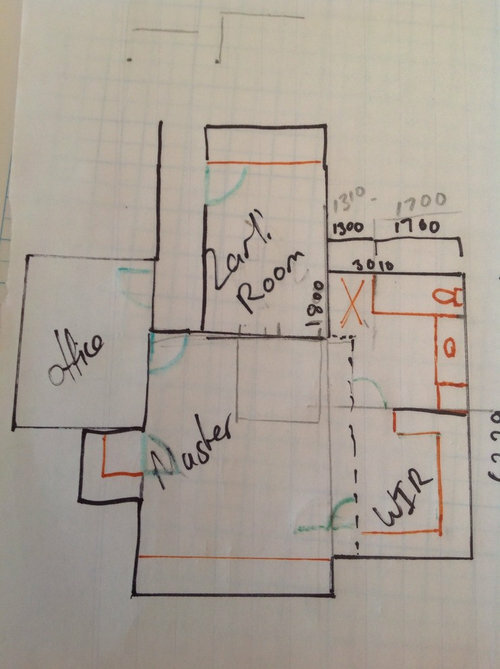 Shown on hand drawn plan. I think that we have ample WIR space between the 2 WIR and will probably use cavity sliders where possible. We have had to holt building very upsetting as we are a family with 3 small children and living in the mess. 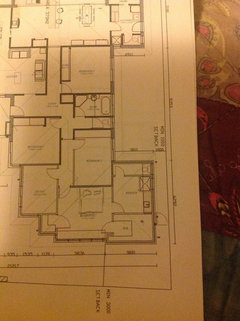 While we go back to council with the printed plans but can change the interior as pad is not laid. I'd have thought that, since it was the architect's error, he should be the one to sort it out to your satisfaction. That said, do you need to change the layout of the en suite, or simply make it shallower? Yes He miss measured the boundary from the existing house in the first place, we now refer to him as baboon but we were monkeys to have used him. This is the first time we have additions it wasn't till we got to council and the planner said " I don't like all plans from him always lack details and full of errors". There were a lot of other errors but our builder has been able to rectify, we really don't want to speak to him and just regret the money spent So are hoping that we can avoid contacting him for sanity sake. Yes, you can definitely have one door. Either walk through the WIR to get to ensuite or vice versa. Definitely have the least amount of doors in any room as they can create unwanted circulation routes through rooms. Decide preferred bed position (generally most private is a good start) then decide which door is to be used either WIR or ensuite. Going by plan I'd guess bedhead against bedroom 2 or ens/wir wall and use the WIR door as access to ens. Your Photo 1, looks good. When considering design options I always consider the "regular use preference". That is, you have an efficient design (toilet location) which you will use all the time. The odd occasion where the toilet flush is heard (OMG) by the occupant of bed 2 would be perhaps 2% of the time? I know it not perfect, but renovations never are. Therefore, if the toilet in that location is efficient for your m.bed, i would go with that over making it inefficient just for the bed 2 occupant to not hear the toilet flush 2% of the time. i hope that makes sense? With the moisture in the WIR, there are options. you could put in an extra ceiling exhaust fan, or ceiling vents in the WIR, or even a small highlight window in the WIR (perhaps a permanent vent or lourves) - i believe there is a solution there for sure. moving the wall 200mm, will just come down to your preference and requirements for clothes. your choice. I hope that helps. Best of luck ! Thank you again D4 design, yes your 2% explanation makes perfect sense to me. we are going with first photo. I would like to move the wall to create a bit more space in between the hanging area in WIR but am concerned about the corner that would be made at toilet will be ugly. So am thinking that I could make bedroom side of WIR shelf storage only 400m deep, our current clothes storage is 4 built in cupboards the width of bedroom 2 so we are already gaining a lot of storage. We also have the small WIR on other side of bedroom. So am sure we have plenty of clothes storage.